“Camp Wandawega is a microcosm of the broader history of Wisconsin resorts. In a single property, you can see many aspects of the historical evolution of Wisconsin resorts in the twentieth century. The land speculation that gave rise to its initial development was indicative of a resort fever that swept the state in the 1920s as leisure time increased and the rapid spread of automobiles increased mobility and allowed people to leave urban centers to experience natural areas. Its subsequent ties to bootlegging and prostitution are evocative of the unexpected societal impacts of our failed Prohibition experiment and the penetration of the lawlessness into the most remote areas of the state due to its proximity to Chicago. The subsequent ownership of the property by the Catholic Church was a phenomenon found throughout Wisconsin’s resorting areas as resorts and summer houses became church properties and functioned as religious retreats because improved transportation infrastructure allowed the wealthy of the Midwest to travel to more far-flung and exotic locations. Its transformation into a summer camp was in line with a blossoming of summer camps in the mid-twentieth century as urban dwellers sent their children to camp as a means to inculcate the values of rural life that they had experienced in their own childhood before seeking the economic opportunities found in larger cities." The 50-plus year tradition of Catholic "Mass In The Grass" is a vital part of the legacy of Camp Wandawega, and remains one of the most critical ways that the historic property continues to serve the local community. Numerous repairs are necessary in order to maintain the condition of the pews, altar, altar canopy, and landscaping, in a manner that is in keeping with the original intention of the Latvian and local community volunteers who began this tradition many decades ago. 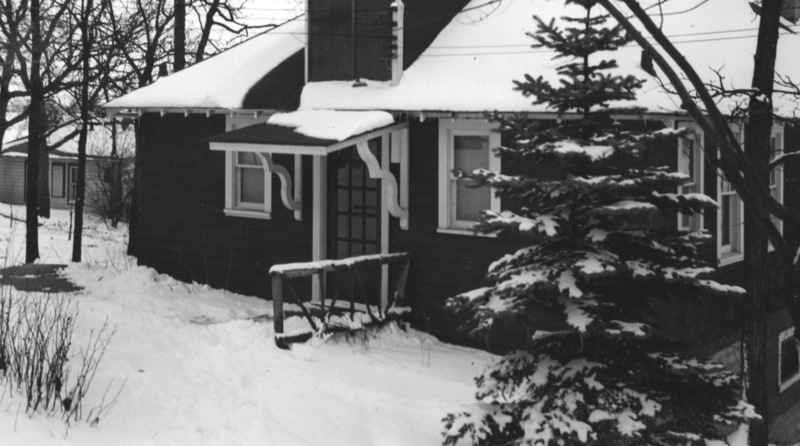 Recently discovered vintage photos have revealed the location and design of modest Adirondack-inspired handrails adjacent to the three bedroom cabin and the old hotel. There were numerous buildings, structures and signs in the Wandawega community built with local materials such as whole, split or peeled logs as well as native fieldstone. Unlike the "Great Camps" of the Adirondacks, the cabins and cottages of Wandawega are quite modest by comparison. The use of native building materials was not only for promoting a natural appearance, but also to avoid the expense of transporting conventional building materials into a remote location. Well-known examples according to longtime Wandawega residents include "The Stick House" and the bridge at the lagoon. Unfortunately these examples, along with the Camp Wandawega handrails, have all been lost to time. No trace of them exists, except for vintage photos and postcards. 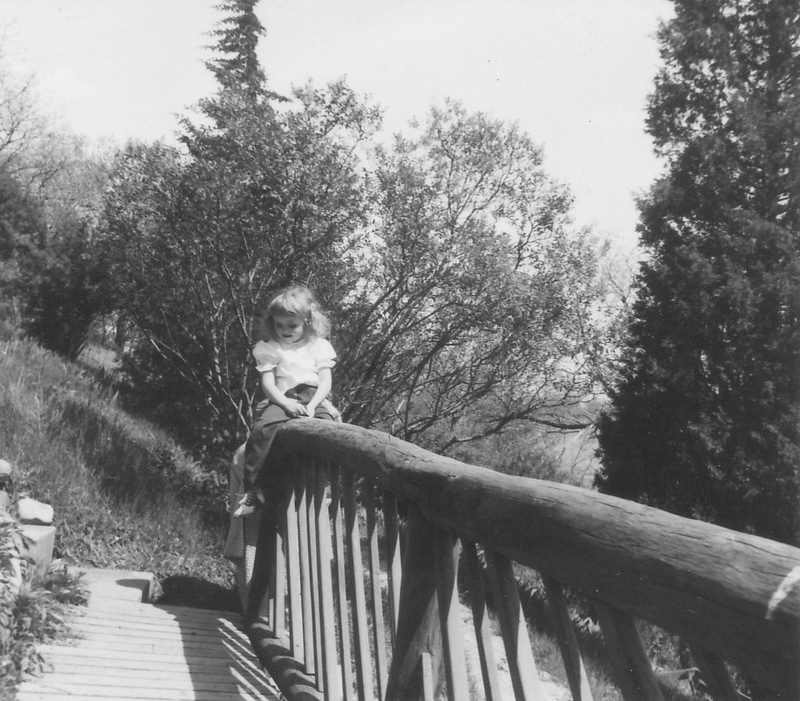 It is our hope to recreate these primitive Adirondack-inspired handrails at Camp Wandawega to better represent the eclectic details of the early years of Wandawega. The same June 21st, 2010 storm that destroyed thousands of trees and damaged three buildings at Old World Wisconsin in nearby Eagle also destroyed nearly twenty trees here at Camp Wandawega. In addition, several invasive species of plants and trees have taken their toll on the Wandawega woods. It is our hope to establish a Forestry Management plan to set a healthy future course for the serene woods and vestigial prairie so that they may continue to be enjoyed by future generations. To date, a memorial tree was planted in honor of Reverend Baginskis, as well as several other commemorative trees, donated by Camp supporters. One of our aspirations is to become a school field trip destination, hosting area students for nature walks, to give them a greater appreciation for the natural environment too often taken for granted. Behind the main house there's a series of terraces overlooking the lake which served as a clipping garden, vegetable garden and herb garden. Per archival photos, we plan to restore and rebuild the native fieldstone walls that separated the levels of the terraces. Over the years, some have washed away, others have been parged over, and others have been replaced with concrete blocks. These planned renovations are intended to serve a new generation of guests and visitors, so that they can once again be used as originally intended. In the early days, as a vegetable and herb garden, and starting in the 1960's, a floral cutting garden by the Latvians for Sunday Mass arrangements. RESTORATION PROJECT: The original Latvian-built terraces: In the 1960s a group of volunteers from the Latvian Marian Fathers community came together to construct terraces overlooking the beach. They have since served as a vital component to every activity hosted for the last 50-plus years. They were constructed almost entirely from salvaged materials – old railroad ties and utility poles were "liberated" from Commonwealth Edison, bricks were sourced from Chicago-area demolished homes, etc. While these same terraces still exist today, they are in disrepair. A re-construction plan is needed to restore damaged timbers, brickwork, and failed drainage tile systems to their original condition, and to allow its continued use for current and future generations. The porticos on the East and South side of the old hotel/bunkhouse are visual signatures of the building, but they require extensive restoration and preservation. Having survived 90 years of harsh Wisconsin winters is no small feat, but they are currently in a sorry state and in dire need of preservation to ensure they are not lost entirely. One of the few distinct architectural details of the property, its vital to our mission to restore and preserve them. 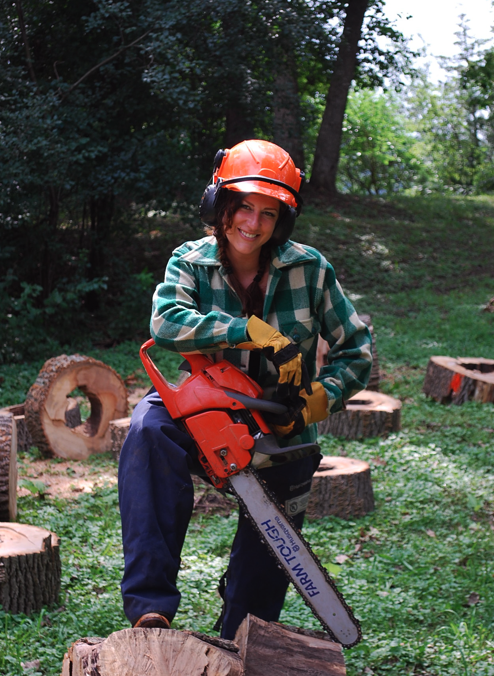 Bill Sargent of Sargent Property Management works with a group of arborists, led by Sam Surratt, who make an annual pilgrimage to Camp Wandawega to help cut away dead limbs that would otherwise be a safety threat. This one was located at the bottom of the terraces, adjacent to the three bedroom cabin and behind the main house. This one was located adjacent to the top floor entrance to the old hotel. This shot from the 1970s shows the pews and altar, made by Latvian volunteers, in their heyday. In the "Vandavega" days, the camp couldn't have survived without the help of the many volunteers. This photo includes David's great-grandpa and great-uncle, among many other family friends. 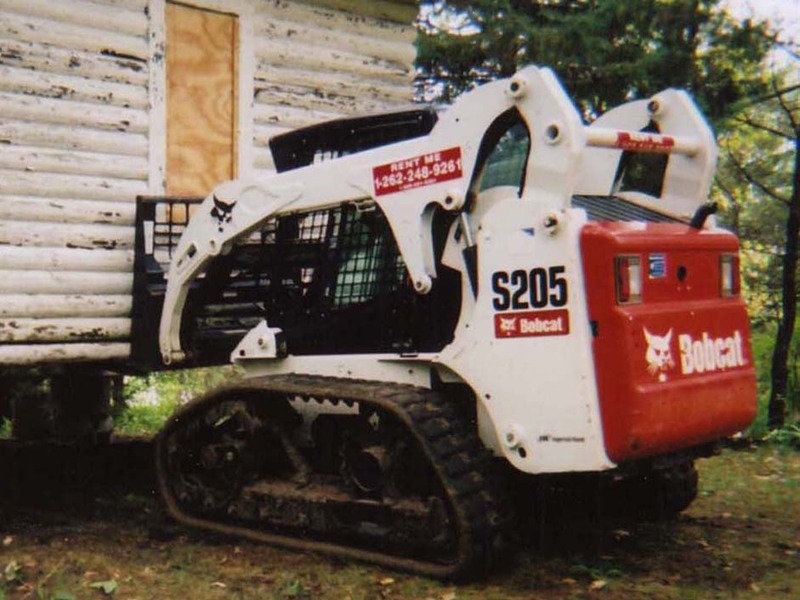 We always have no shortage of tasks made easier by a Bobcat, from resetting a cabin, to clearing scrub, to moving rocks, etc. Old, fallen trees being processed for campfire wood. Tereasa and volunteer pal Brittany Reeves helping to refresh the old shuffleboard court. In the early days of the renovation, we had to make multiple trips to the scrapyard.